Some 16,000 people rallied Tuesday 23/09 in Tokyo against the government’s plan to restart nuclear reactors, more than three years after the Fukushima disaster. 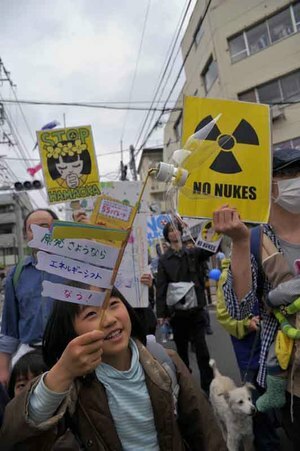 It was one of the largest anti-nuclear demonstrations since the state nuclear watchdog on September 10 approved plans to restart two reactors at the Sendai plant in southern Japan. “Three and a half years has passed since the nuclear accident, but self-examination has yet to be made,” Nobel literature laureate Kenzaburo Oe told the Tokyo rally, according to public broadcaster NHK. “The government is going ahead with the plan to resume operation at the Sendai plant without compiling sufficient anti-disaster plans,” Oe said. After the rally demonstrators marched through the capital, carrying banners like: “We don’t need nuclear plants”. As the government tries to convince a skeptical public about the necessity of nuclear power, on Sunday 21/9, new industry minister Yuko Obuchi said the resource-poor nation should be “realistic about its energy needs”. In pre-Fukushima Japan, nuclear power accounted for nearly one-third of the country’s energy needs. The Nuclear Regulatory Authority has said the two reactors were satisfactory but hurdles still remain, including getting the consent of local communities in a country still scarred by the catastrophe where all 48 viable reactors are offline. Widespread angry anti-government and anti-nuclear sentiment has simmered ever since the earthquake and tsunami in March 2011 caused meltdowns at Fukushima, sparking the worst atomic disaster since Chernobyl. Tens of thousands of people were evacuated from their homes, many of whom have not been allowed to return. Scientists say some areas might have to be abandoned forever. There have been anti-fascist and anti-government demonstrations taking place, and angry protestors accuse the media and state of hiding the news of them occurring and so trying to stop the people’s rage from being known. Text of a leaflet distributed in Brussels (Belgium) in April 2011. We took big risks depending on nuclear energy in exchange for creating unlimited prosperity. Then we are now facing assumed danger. Human beings seem to have taken a wrong choice. We have to make sure. No more nuclear plants. We individuals living in Tokyo are planning an demonstration against nuclear plants on 10th April in Koenji, Tokyo. We also would like to call for global solidarity actions on the same day. We believe that the global response and action will be significant support for all disaster victims and movements against the current nuclear policy in general. This is a global call for actions on 10th April. We sincerely hope that you will take any actions together on that day. Work with us in solidarity against all nuclear plants worldwide! Plans for actions and Records of actions.